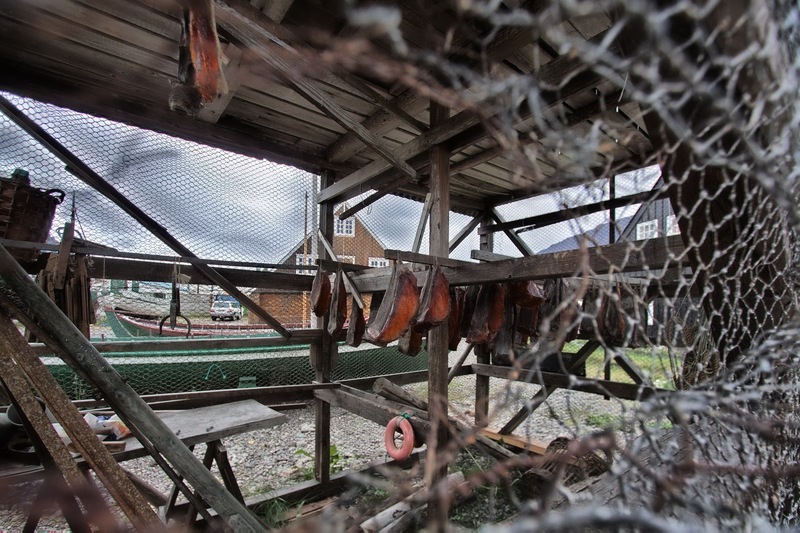 In Isafjördur they dry fish to make the types of dried - and therefore preserved - fish. This house here hosts mostly drying shark. Icelanders eat grey shark, dried, cubed. Oh, and they do like to shock tourists by serving it. I recommend Brennivín with it. This photo was taken in the harbour area of Ìsafjördur, Westfjords of Iceland. There is an open air historical museum in the front part of the harbour peninsula and the drying house - hosting real shark - is set up there. It is not your typical museum but just a collection of houses, one hosting exhibits, one hosting an incredible fish restaurant, and more. The photo is a HDR made of 3 exposures, handheld through a hole in the fencing. The 3 CR2 files were imported straight into Dynamic Photo HDR and processed in fusion blending. Little post production. We did try it a few times already and actually like it. Not everybody does, though. Right underneath the part about Hákarl there is a section on Hardfiskur (dried fish), that is part of that drying tradition. Oh, when you are on that blog already: Try that reciepe for date cake and tell me how you like it. I made it twice already and I am blown away. Oh, I did make it without the caramel topping, but once I bought a bottle of caramel sauce. Both versions work well.